The icon only appears on tabs where you viewed several pages. If the icon is unavailable, go to your entire browsing history. Restriction. The tab history contains the last 12 pages that were open. If you don't find the page you are looking for in that list, go to the list of your entire history. Click → History → History. Click Delete the following above the page list. 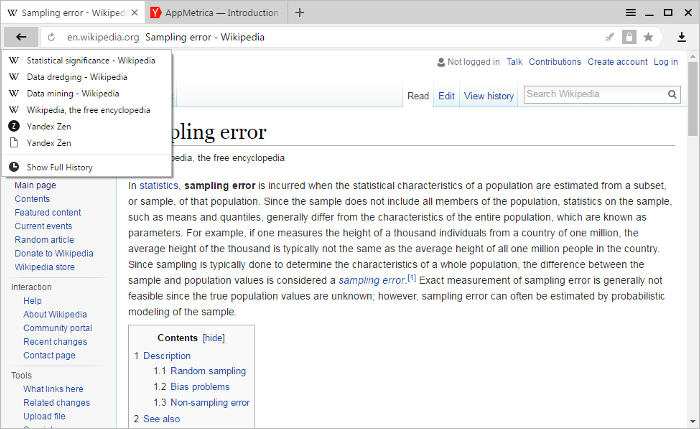 The history of pages that you visited on your computer is synced. If you reinstall your browser and then enable syncing, your history will display at browser://history/. The history of pages that you visited on other devices will not display in the browser interface. 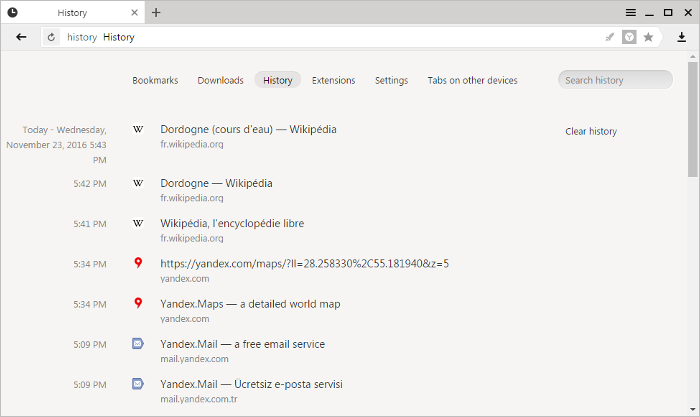 However, if you sync and then start entering the address for a site that you visited on another device, that address will appear in your search suggestions. Sites pinned to the Tableau are an exception to this rule. Click → History → History, and then Clear history in the upper-right corner of the tab. 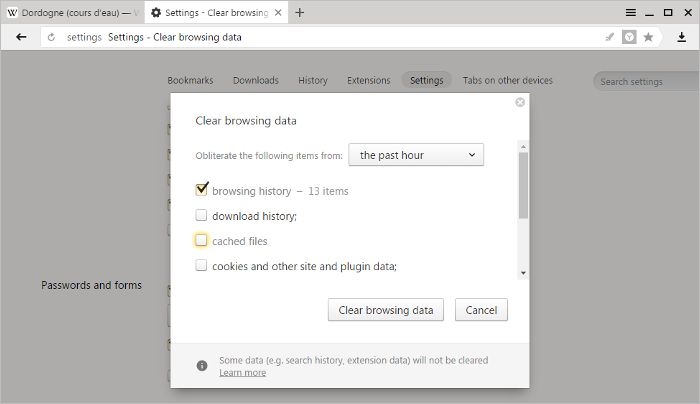 In the Clear browsing data window, set the time period that you want to delete the history for. If necessary, deselect all other options. 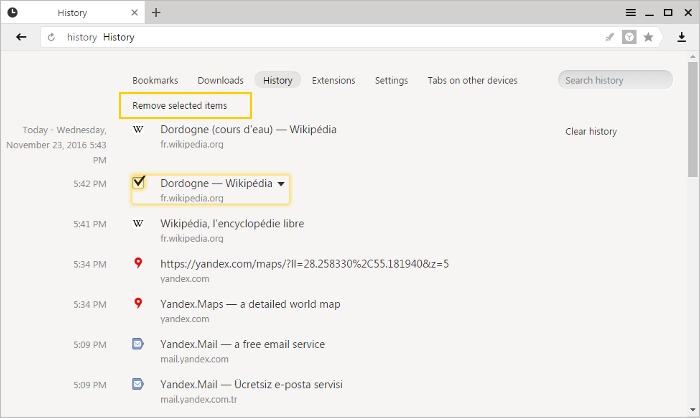 To restore a browsing history that you recently deleted, check the date when changes were made to the History.bak file in the C:\Users\Your account name\AppData\Local\Yandex\YandexBrowser\User Data\Default directory (to see the AppData folder, enable hidden folder display). Move the History file to another folder (such as your Desktop). 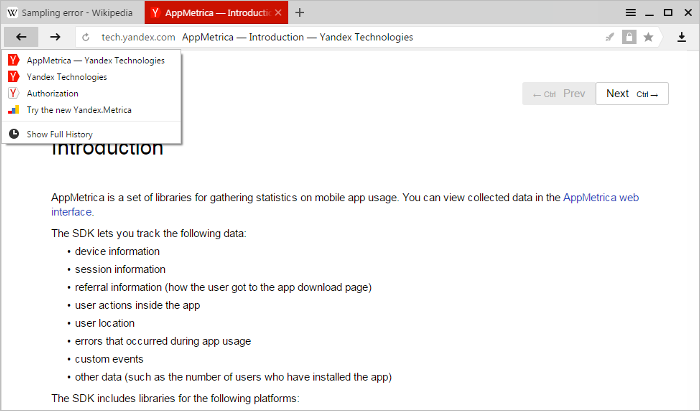 Go back to the C:\Users\Your account name\AppData\Local\Yandex\YandexBrowser\User Data\Default folder. Rename the History.bak file to History. If you do all this correctly, your history will be restored. If your history isn't restored, put the History file back in the folder. Note. If the date when changes were made in the History.bak file is the current day, then it is not possible to restore your history.